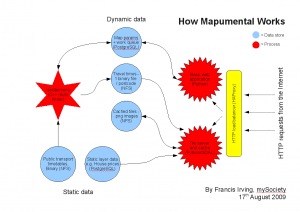 What tool do you use to create the “how mapumental works” diagram? The public transport tiles for a particular postcode / time are only generated for the places people have browsed. They are then cached in the “Cached tiles” blue circle on the diagram. Looking at the caches, most are about 2Mb to 8Mb in size, although some are much larger if the person scrolled about a lot. We haven’t yet run out of disk space – there is currently 8 terabytes free on it, so I’m not worried yet! I suspect the storage we use will change, as we make it scale onto larger numbers of machines. I’m not convinced NFS will perform. David – I used Open Office Draw, in its standalone version oodraw. It turns out it actually has connectors which clip onto objects, a facility I couldn’t find in Inscape, but it’s likely I was just being dumb. Interesting… care to elaborate on the problems you’re having with HAProxy? Some session affinity issue? It would often drop one server, and then not start using it again in a mysterious way that I couldn’t track down. I also found it surprising that it didn’t have a dynamic load balancer, which would adjust which server it sent requests to based on how loaded they were. I’m planning on trying both nginx and Amazon’s Elastic Load Balancer to see if they do better. Oh yes, sorry! I’ve just sent out another 100 invites. We’re currently working on changes to make it scale well so it can come out of beta, but it’ll be a while before its ready I’m afraid. We’ll use the invites to help test as we change things for that. This is really beautiful and useful mapping! Nice one. One question/suggestion – how about applying this to cycling? The (also Cambridge-based) guys over at http://www.CycleStreets.net are doing a fine job on using the OpenCycleMap network to apply routing algorithms, and there are an awful lot of people in the country who’d love a “find me a place to live where I could cycle to work” – especially if (as cyclestreets do) it’s not distance based but based on quietness and the national cycle network. Yup, I know the cyclestreets people! As well as cycling, car travel would be useful for lots of people too (maybe we can reduce car commute time). We use a special route finding algorithm to generate all the routes, but probably not that bad to code on top of the cyclestreets systems. We’re generalising everything so it is in separate components so will be easier to add soon. Do you know the cyclestreets codebase, and have access to their data? If you can get that now, then will be in a good position to integrate with mapumental later. We do have a currently-undocumented XML interface to the planner which could be used, but the number of queries you would be sending would collapse our single server 🙂 It’s on our to-do and strategy lists to make a formal API. We plan to open-source the CycleStreets code in due course (there’s a lot of refactoring still going on, and audits needed first). Once that’s done I imagine you should then be able to install a local instance and fire away your own queries. However, I suspect it will still be too slow though, because the engine is necessarily optimised for detailed street results rather than an overall rough time/distance result. I do wonder whether a more general-purpose road router would approximate sufficiently though. how do you plan to keep information updated? For example I imagine with additional funding, some places have the potential to become much more picturesque, others to go downhill. It’s an issue I’m grappling with myself at th emoment because I’m hoping to create a visual way to understand services for parents and disabled people by location, however my struggle at the moment is how to collect, but also maintain this information which seems to change frequently! Celine – we’re currently reworking most of the code, splitting Mapumental into three separate components. One of those is a contour rendering tile layer which will have the facility to manage many such layers. So for a new version of data, we can make a new layer with a new date, then flip the application to use it. So yes, you have to plan for updates to the original data! 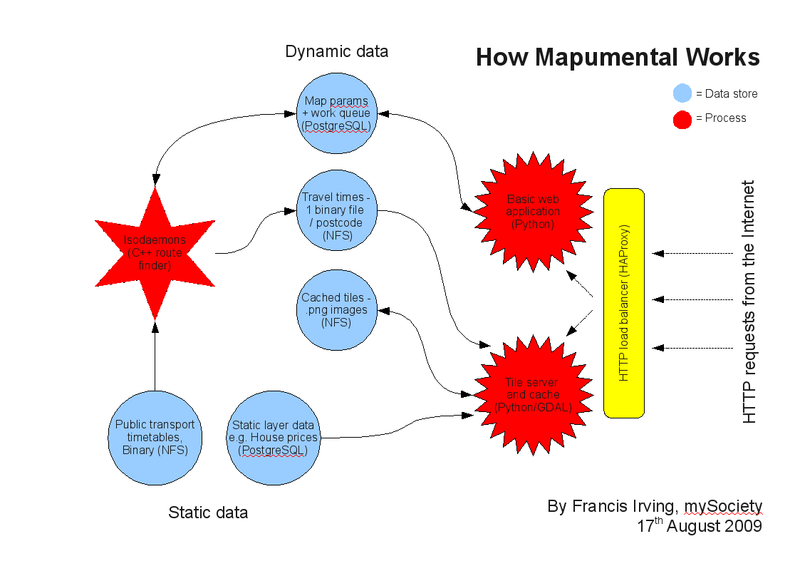 Mapumental really does rock and I can’t wait for it to come out of beta (and perhaps have more functionality such as dual centres, more specific house price data etc). A friend of mine has been relocated to an office in Central London as the company he works centralised operations. Clearly the highly paid individual who took the decision had little regard for the cost of transport, living etc. As a result my friend is looking for a new job not involve a lengthy commute into London. It would be nice to have a tool companies could use to match annual salary to affordable places to live, or to areas in the UK with the right skills match (Leeds and Chester both have lots of banking back office functions and are easy commutes to London for meetings etc).